New Mexico Dahl Sheep are an almost extinct Spanish Colonial heritage hair sheep breed under development at Terra Patre Wildlife Preserve and Teaching Farm in Colorado and New Mexico. 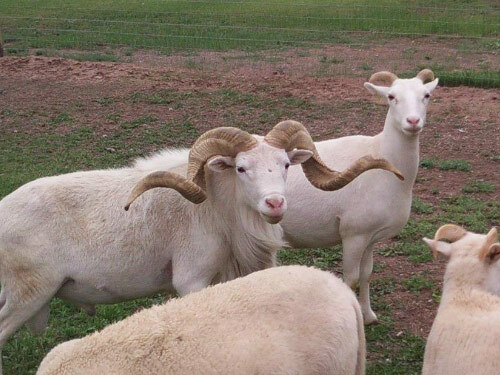 The goal in developing these unique sheep was to produce a truly multi-marketable, low-maintenance product. These hardy, no-shear sheep are beautiful and majestic with the rams supporting magnificent horns. They are also very excellent sources of lean, less mutton-tasting meat. NM Dahl is taking this one step further and wanting to increase the meat marketability along with increasing the growth of the horns not only on rams but also on the ewes for even better future horn genetics. With this in mind, New Mexico Dahl Sheep are hybrids of the best horned and meat hair sheep. Beginning with the descendants of hair sheep brought to the USA in 1598 by the Onate Spanish Colonists, and not being limited to breeding within the Corsican Sheep family (Texas Dall, Black Hawaiian, and Painted Desert Mouflon crosses), breeding is based solely on a focus of easy care, big horns, and heavy meat carcasses, as well as maintaining the shedding ability in these wonderful hybrids.